Bijan’s research concerns young people’s engagement in resolving global social and environmental injustices. Currently, he is a Senior Associate for Community Based Research and Data Analysis at the Citizens’ Committee for Children of New York (CCC) where he is responsible for community data collection projects. These projects complement CCC’s Keeping Track data and elevate the voices of community members, service providers, and other experts, especially when public data are lacking. 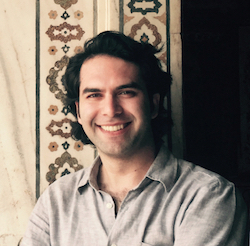 From 2011 to 2016, Bijan worked with the Children’s Environments Research Group in Center for Human Environments, where he directed the Article 15 Project and other international research initiatives. The Article 15 Project became part of Bijan’s dissertation and larger program of research examining the internal decision-making structures of children’s associations around the world and how each organizational structure improves communication and trust among group members, as well as children’s rights as citizens. As a member of the Public Science Project, also part of the Center for Human Environments, Bijan collaborated with New York City youth on the Food Justice Project, a participatory action research team investigating the food environment of a neighborhood in Brooklyn. The focus of the project, in part, was incorporating young people’s perspectives into the academic and public discourse on low-income individuals’ accessibility to fresh and healthy food.